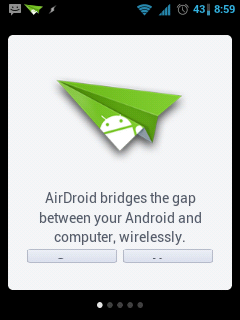 I've been using Airdroid since launch. But the recent update broke the layout making it impossible to scroll and trimming buttons, such that I cant view the text.Also, When I enter the the address in browser, it is continuously 'loading' and never finishes. I get only a blank screen. Sorry for the trouble. We will fix this soon with next update.